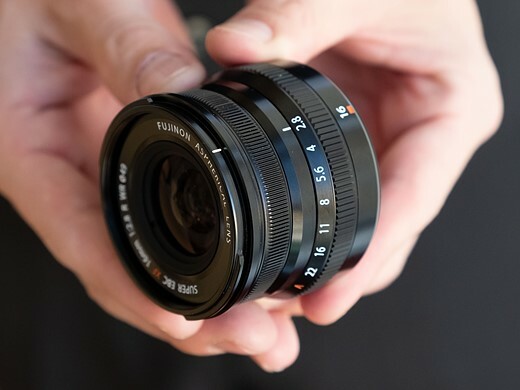 First up is the GF 50mm F3.5, which was placed on Fujifilm's GF roadmap back in September. Shown here on the medium-format GFX 50R, the GF 50mm F3.5 covers a focal length equivalent to 40mm in 35mm terms, making it a so-called 'normal' standard lens. In terms of subject isolation, you can think of it as offering F2.8 full-frame equivalent depth-of-field, thanks to the reverse 0.79x crop factor. As you can see, for a lens designed for a modern medium-format system, it's impressively small. 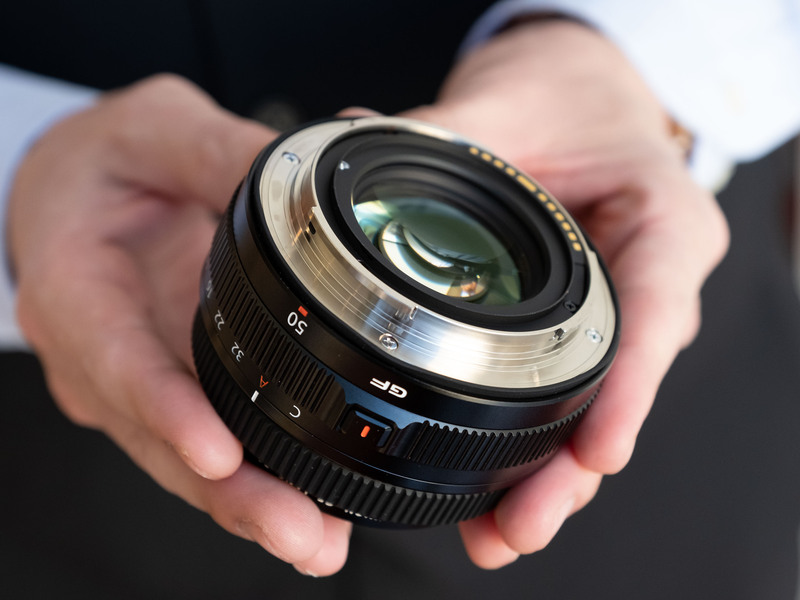 Even more impressive when you consider that the GF 50mm F3.5 contains nine elements in six groups, including one aspherical element. Note the small front element - more on that in a minute. An ideal companion for the (relatively) compact GFX 50R, the 50mm F3.5 provides a versatile and very portable solution for day to day photography. Autofocusing performance seems good, from our brief time with this pre-production sample, and focus acquisition is fast and quiet. 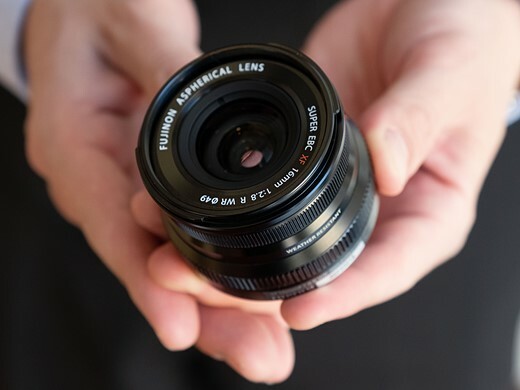 Manual focus (as with all GF lenses) is 'focus by wire', via the slim focus ring towards the front of the lens. This shot shows the rear element of the GF 50mm F3.5. 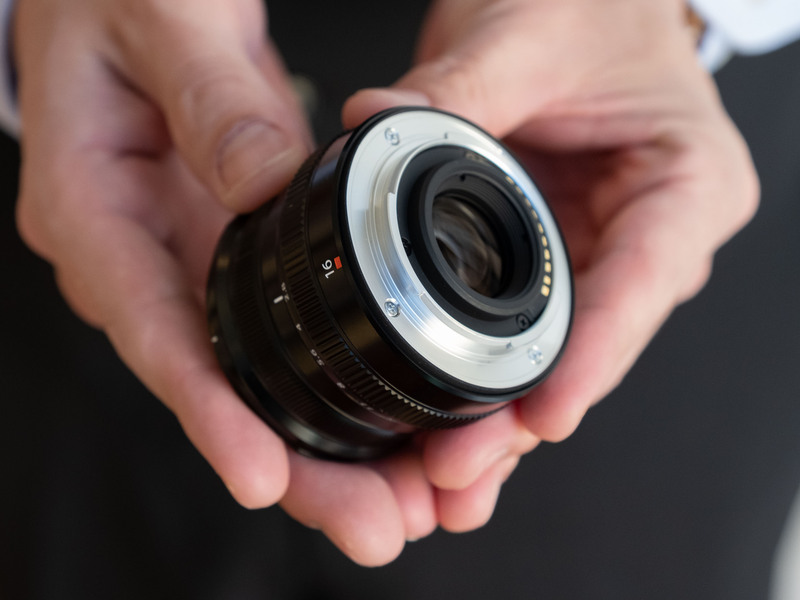 Compare this with the markedly small front element, and you might spot a theme with modern prime lenses designed for mirrorless systems. 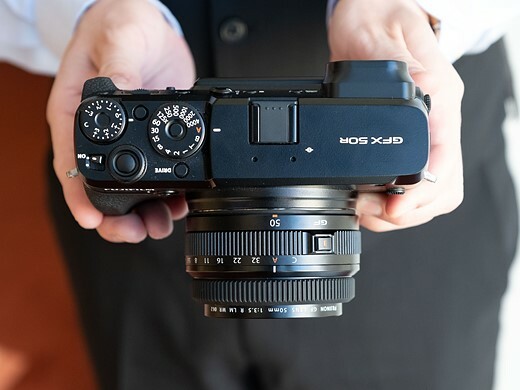 The short flange back and wide diameters of dedicated mirrorless camera mounts compared to legacy SLR systems allow optical designers to include large rear elements, positioned close to the imaging surface. Large rear elements allow for the potential to keep light rays at the peripheries of the image somewhat perpendicular to the sensor - in other words, less oblique. As such, higher resolution, lower chromatic aberration, and less vignetting can be achieved nearer to the edges of the frame. This can also mitigate the need for complex software corrections. Furthermore, by making the rear elements of lenses like this slightly convex relative to the imaging surface, light that reflects back from the sensor can mostly be bounced outwards, beyond the imaging area. This reduces the risk of 'ghosting' when bright highlights appear in a scene. 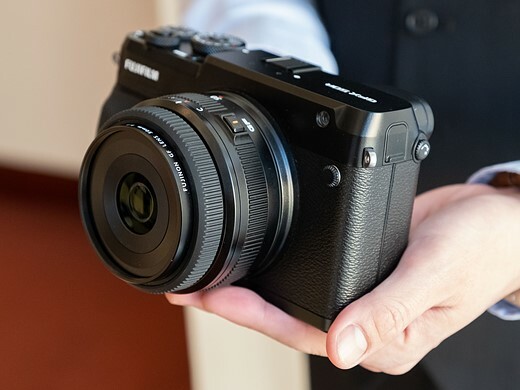 The GF 50mm F3.5 will be available later this year, pricing still TBD. Next up is the XF 16mm F2.8 for Fujifilm's X-series APS-C format cameras, which was added to Fujifilm's XF roadmap last summer. 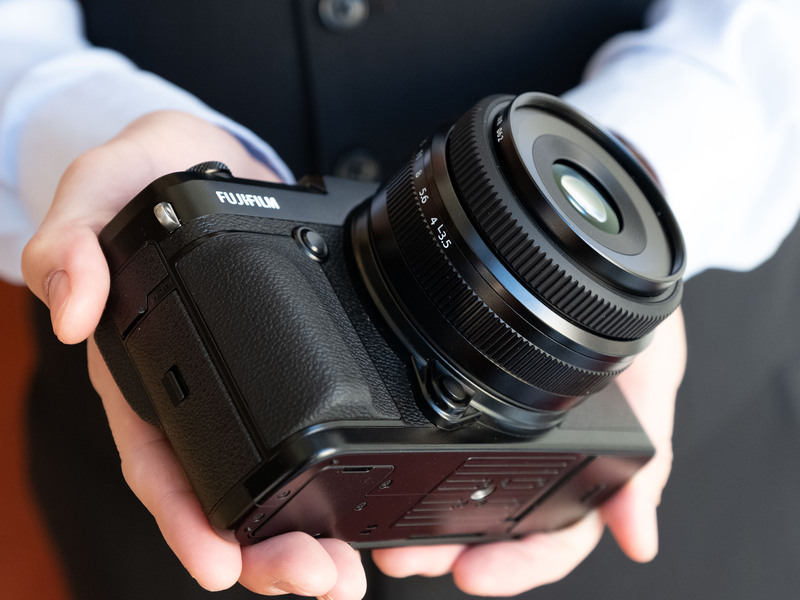 Equivalent to a 24mm F4.2 lens in full-frame terms, the XF 16mm is a tiny lens, perfect for street photography and landscape work, where portability is more important than a bright aperture. Similar in general styling to Fujifilm's 23mm, 35mm and 50mm F2 primes, the XF 16mm F2.8 really is tiny, and weighs in at only 155g. Despite its compact dimensions, it is sealed against dust and moisture incursion - you can just make out the rubber gasket around the lens mount in this shot. Optical construction of the XF 16mm F2.8 comprises 10 elements in eight groups, including one aspherical element. Autofocus from this near-final sample (we tried it on an X-H1) is very fast and effectively silent. It will be available next month, pricing still TBD. 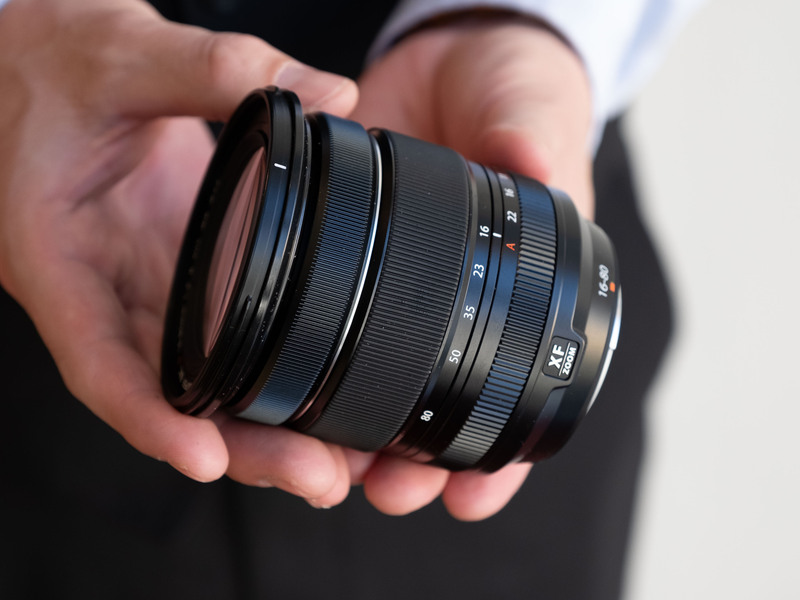 Finally, here's the XF 16-80mm F4. 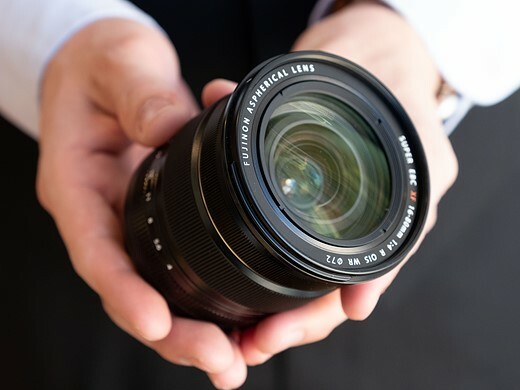 Also added the roadmap last summer, the 16-80mm is optically stabilized and covers an equivalent focal length range of 24-120mm, with equivalent depth-of-field of a F6.0 lens. It's a versatile standard 'do everything' zoom lens for Fujifilm's XT-class mirrorless cameras. As you can see, at its 16mm position this lens is highly compact. Zoomed in all the way to 80mm however, it almost doubles in size. Inside the barrel you'll find 16 elements in 12 groups, including no fewer than four aspherical elements and one ED. The relatively large front element supports a 72mm filter thread. 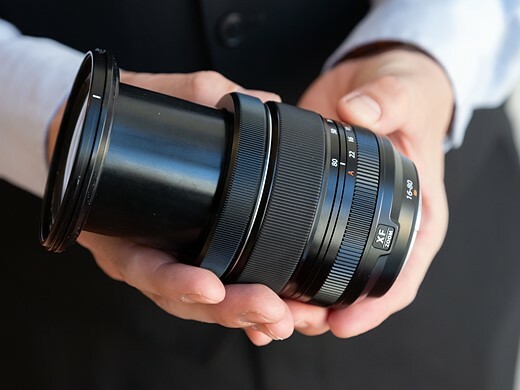 Like the XF 16mm F2.8, the XF 16-80mm F4 is 'WR' (weather resistant). Pricing and availability has yet to be confirmed.